Raider Magazine was first launched in 2008, following four successful years for Ebcon Publishing. The magazine’s main focus on launch was to provide the general public with as much information as possible regarding a number of Armed Forces services around the world, as well as providing members of said Armed Forces with a number of no-nonsense, informed reviews, so they could spend their hard earned money on deployment equipment, knowing that it would survive the various rigors they faced in the various areas of operation they found themselves in. Fast-forward to the present day, and Raider Magazine has evolved with the times. Originally launched during the height of the Afghanistan and Iraq conflicts, military operations around the world have begun to quieten down, and due to this Raider has had to change direction. With the introduction of the ‘Tactical’ market, Raider has worked to fill the said market. 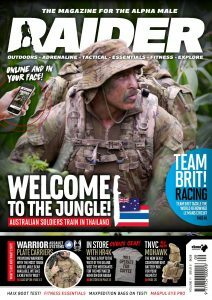 With the tag-line “The Magazine for the Alpha Male”, Raider covers everything and anything that any individual interested in the tactical market may need – from gear reviews to features, all whilst keeping its original military origins deeply rooted within the magazine.